A particular Honda Activa in Mysore, has 635 cases registered against it. In a baffling development, the city of Mysore has in all probability just reported a benchmark of most traffic tickets not settled. During a routine traffic check in Mysore, police stopped a rider for not wearing a helmet while riding his Activa (regn. no – KA09HD4732). As they prepared to write a challan, the system threw up the most unbelievable of accounts. 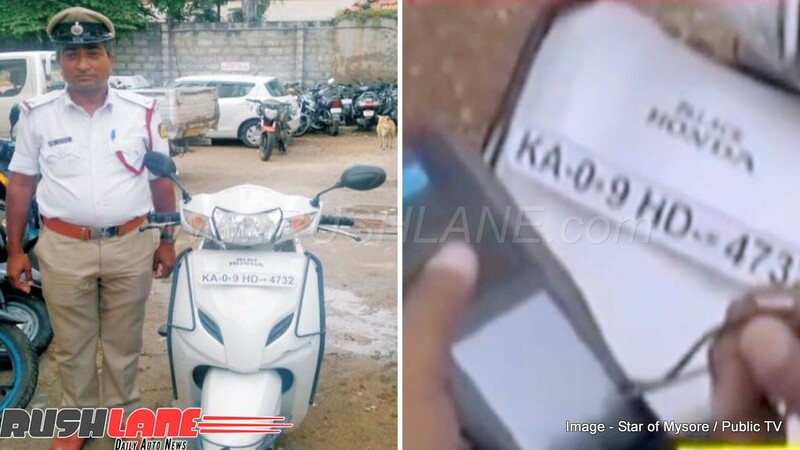 As per the registration number, they found that there have been 635 traffic violations ranging from signal jump, riding without helmet and DL logged in for the Activa. The total fine amounts to Rs 63,500. Most of these offences can be validated through CCTV footage at traffic signals. The errant scooter in concern has been confiscated by the police. Neither the owner (Madhuprasad K.) is in a capacity to pay the fine, nor the scooter is in a condition to be sold to recover outstanding dues. Police are still wondering ways to work out this issue. Police are clueless as what to do next. Auction will only give them about Rs 20-25,000. The scooter which was purchased in March 2015, does not even have a valid insurance, as mentioned on the government website. Without insurance, you cannot legally sell a vehicle. As RTO will not issue a transfer without insurance. So, even if the police wants to get some money out of the scooter, they will have to shell some money from their own pocket first, in buying insurance for the said scooter. If you have a suggestion for the cops, as to how they can recover the fine, do share with us in the comments section.